(21516.91.B, Mary E. Jones Parrish Collection, OHS). Tulsa beckoned multiple souls in the early 1900s. These seekers, white and African American alike, shared a vintage American optimism. They came in search of a better life. The overwhelming majority of the African American migrants eventually located in the area that would become the Greenwood District, the main thoroughfare of which was called "Black Wall Street." As the Greenwood District began to emerge in the early 1900s, rigid segregation held sway. Segregation, ironically, gave rise to a nationally renowned black entrepreneurial center. As families arrived and homes sprang up in the Greenwood District, the need for retail and service businesses, schools, and entertainment became pronounced. A class of African American entrepreneurs rose to the occasion, creating a vibrant, vital, self-contained economy that would become Black Wall Street, the talk of the nation. Black Wall Street, more commonly known simply as Greenwood Avenue, had it all: nightclubs, hotels, cafés, newspapers, clothiers, movie theaters, doctors' and lawyers' offices, grocery stores, beauty salons, shoeshine shops, and more. 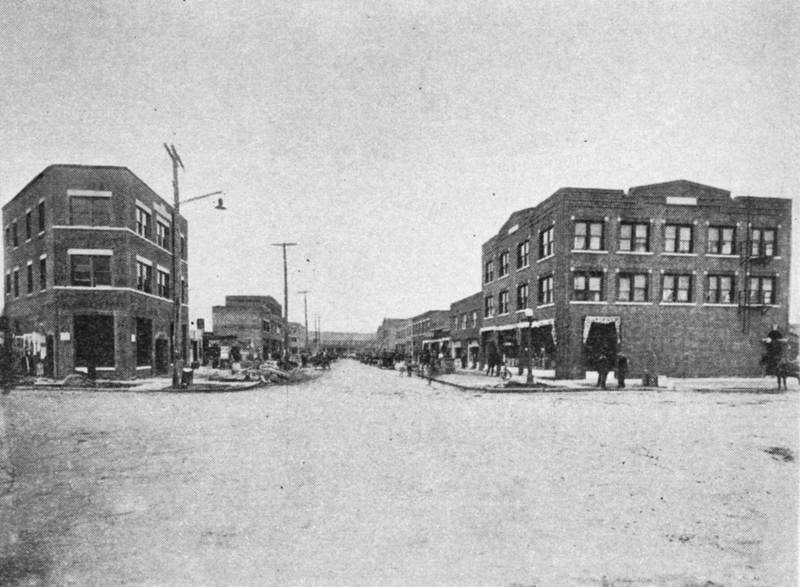 So developed and refined was Greenwood Avenue, the heart of the Greenwood District, that many compared it favorably to legendary thoroughfares such as Beale Street in Memphis and State Street in Chicago. In the spring of 1921 underlying social and economic tension in Tulsa sparked the worst racial violence in American history. As many as three hundred people lost their lives. Property damage ran into the millions of dollars. The Greenwood District, the thirty-five-square-block-area that comprised the city's entire African American community, lay in ruins. Tulsa's African Americans ultimately turned tragedy into triumph. They rebuilt the ravaged Greenwood District, which by 1942 boasted 242 black-owned and black-operated business establishments. Integration, urban renewal, a new business climate, and the aging of the early Greenwood District pioneers caused the community to decline through the years, beginning in the 1960s and continuing throughout the 1970s and early 1980s. Few businesses remained at the end of the twentieth century. The Greenwood Cultural Center, a multipurpose educational, arts, and humanities complex promoting history, culture, and positive race relations, anchors the modern-day Greenwood District. This multimillion-dollar community landmark, constructed in the 1980s, serves as a direct link to the district's storied past and as a living memorial to the legacy of Tulsa's historic Greenwood District and its Black Wall Street. Scott Ellsworth, Death in a Promised Land (Baton Rouge: Louisiana State University Press, 1982). Eddie Faye Gates, They Came Searching: How Blacks Sought the Promised Land in Tulsa (Austin, Tex. : Eakin Press, 1997). Hannibal B. Johnson, Black Wall Street–From Riot to Renaissance in Tulsa's Historic Greenwood District (Austin, Tex. : Eakin Press, 1998). Hannibal B. Johnson, Up From the Ashes–A Story About Building Community (Austin, Tex. : Eakin Press, 1999). Mable B. Little, Fire on Mount Zion: My Life and History as a Black Woman in America (Langston, Okla.: Melvin B. Tolson Black Heritage Center, Langston University, 1990). Mary E. Jones Parrish, Events of the Tulsa Disaster (Tulsa, Okla.: Out on a Limb Publishing, 1998). Hannibal B. Johnson, "Greenwood District," The Encyclopedia of Oklahoma History and Culture, https://www.okhistory.org/publications/enc/entry.php?entry=GR024.